You may understand and further refine your query results by using the "drill-downs" by category, the "Refine Query" form or "Remove Similar" drop down menu. The "drill-down" charts and links aim to give an insight of the main characteristics of the PDB entries in the query results and enable to easily focus on the subset of interest. The "drill-downs" aim to be simple rather than complete and provide a small number of drill-down options. 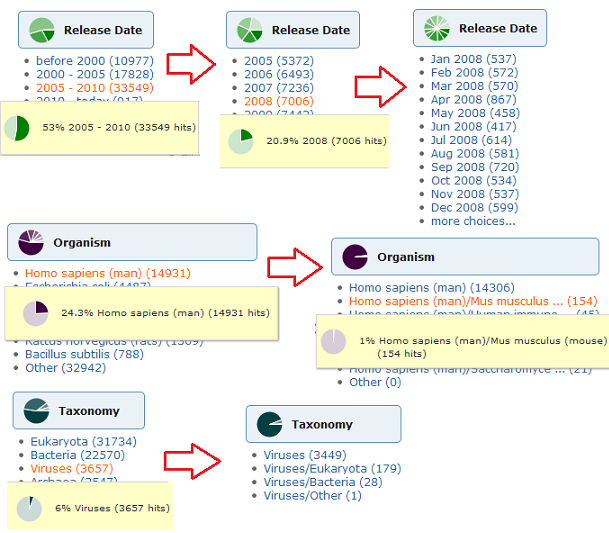 Drill-down groups of small size, are not even displayed in the charts. If the available drill-down options are not satisfactory, clicking on the alternative "more choices ..." link will display the "Refine Query" form for the corresponding category, where it is possible to refine the query more precisely. Complexes with polymers of different types are presented separately. So the "drill-down" link "Protein" will result in pure protein entries. 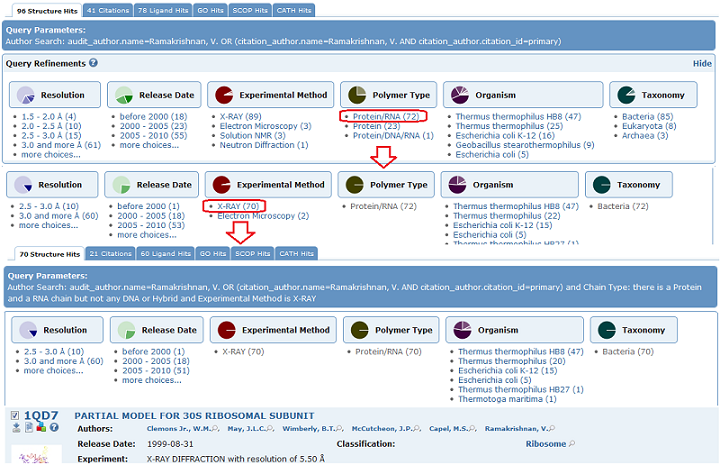 The exact organisms/strains assigned to a PDB entry are presented. Drilling down on the "Escherichia coli" link for example will not result in entries of E. Coli strains (otherwise these entries would be counted twice in the charts). 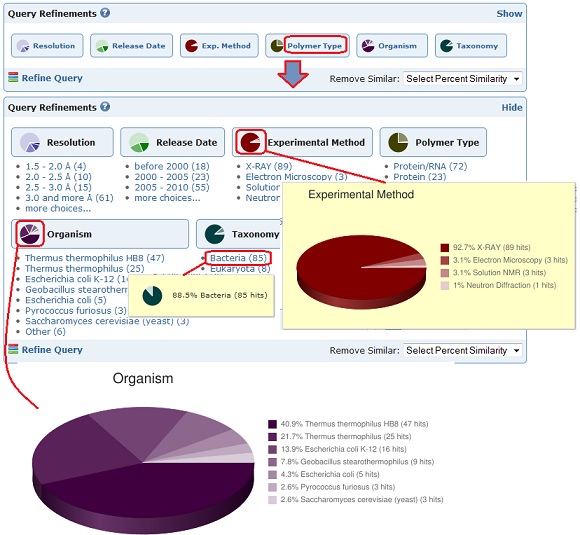 The "Other" drill-down link can be used to exclude the presented groups from the results, and allows to navigate over organisms. On the root level, organism groups include cases of hybrid entries (cases where an entry has a polymer chain of this organism and a polymer chain from another organism). But when the user drills-down on a single organism (all results include that organism) the hybrid entries are listed explicitly. This link will present the advanced search interface, which will list all the search criteria of the current query. Using this form you may change parameters of these criteria, remove any that you wish or add new criteria from the available "Query types". Filter search results based on sequence similarity and keep only "unique" structures. Selecting a percent value from the pull down menu will filter the search results in such a way that multiple structures whose sequences have at least the specified level of sequence identity will be represented by a single structure. For further information on the methodology used for clustering and ranking sequence similar structures in the PDB, see Redundancy in the Protein Data Bank.